Firefighters have warned of the dangers of zapping sponges and cloths in the microwave despite a study showing it could kill harmful bacteria. Microwaving kitchen sponges for just two minutes can kill 99% of living pathogens, a US study in the Journal of Environmental Health claims. But Shropshire fire service warned that one fire had already occurred when someone in Telford tried the technique. The researchers said people should only try to microwave damp sponges. A statement from Shropshire Fire Service said they had attended a fire which involved a dishcloth in a microwave oven. "Shropshire Fire and Rescue service strongly advise the public not to attempt to sterilise sponges or dishcloths in this way. "Attempting to sterilise a dishcloth in this way is extremely dangerous. "There are too many variable factors such as the capacity/power of the microwave oven or the moisture content of the dishcloth or sponge." Around 1.3 million people a year in England and Wales are estimated to suffer from food poisoning. Sponges and dishcloths are a common source of pathogens which cause food poisoning because the bacteria, which come from uncooked eggs, meat and vegetables, thrive in the damp conditions. It has been estimated that a kitchen sponge may contain 10,000 bacteria, including E. coli and salmonella, per square inch. Professor Gabriel Bitton, a expert in environmental engineering at the University of Florida, and colleagues contaminated kitchen sponges and plastic scrubbing pads in dirty water which contained faecal bacteria, viruses, protozoan parasites and bacterial spores. They then zapped the cleaning equipment in a microwave for varying lengths of time. After two minutes on full power, 99% of bacteria were inactivated. And E. coli bacteria were killed after just 30 seconds. 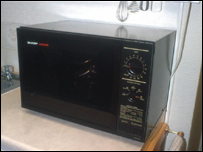 Bacillus cereus spores - which are largely associated with vegetables or foods in contact with soil and are normally quite resistant to radiation, heat and toxic chemicals - were completely eradicated after four minutes in the microwave. Professor Britton said it was likely to be heat, rather than radiation, that proved fatal as microwaves worked by exciting water molecules. He recommended microwaving damp not dry sponges to minimise the risk of fire and to only microwave non-metal scrubbing pads. Two minutes every other day would be sufficient for people who cook regularly, he said. "Basically what we find is that we could knock out most bacteria in two minutes. "People often put their sponges and scrubbers in the dishwasher, but if they really want to decontaminate them and not just clean them they should use the microwave," he said. The team also looked at whether the microwave oven could be used to sterilise contaminated syringes. It was found to be an effective method but took far longer - up to 12 minutes for the Bacillus cereus spores. Professor Hugh Pennington, a food safety expert at the University of Aberdeen said heating was an effective way of sterilising kitchen equipment. "If you want to make sure you have a clean sponge there's nothing wrong in popping it in the microwave but I'd rather people didn't use sponges." He added that most cases of food poisoning occurred when people were preparing raw chicken and then used the same surface to prepare ready to eat foods such as salad. "I don't think it would make a difference to food poisoning figures but I can't see anything wrong in it. He said heat was an obvious method of sterilisation. The Royal Society for the Prevention of Accidents backed the advice from the fire service and said microwaves "should only be used for the purpose to which they're intended".